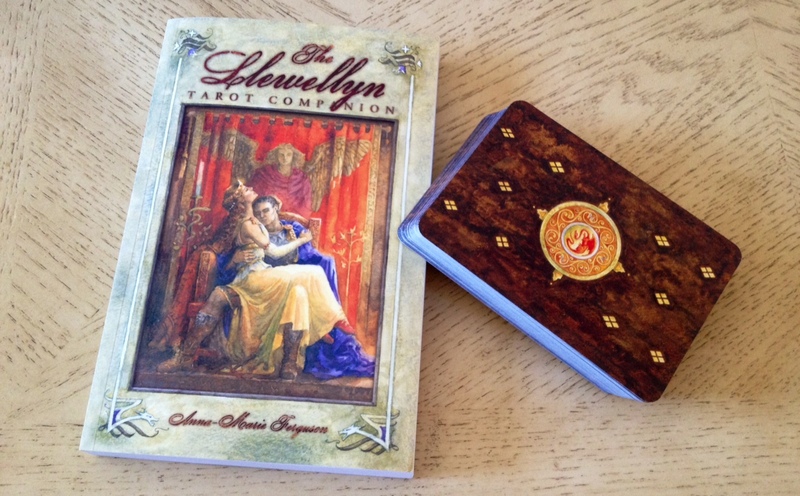 I’m always looking for RWS-based tarot decks that I can recommend for beginners who aren’t visually ready for the original RWS, and I’ve found one: the Llewellyn Tarot by Anna-Marie Ferguson and published by Llewellyn Worldwide. This deck has climbed up to my top five recommended beginner tarot decks or, heck, anyone interested in the Wales and Welsh culture of the Middle Ages. The deck comes with a really comprehensive 5″ x 8″ guidebook that does a good job introducing tarot to the beginner but also has so much traditional Welsh folklore and mythology that I found it to be an incredible read, and should be equally enlightening to any seasoned tarotist. The cards themselves are 3.125″ x 4.5″, with thick borders all around. I’ve seen many tarot readers trim their copy of this deck and I’ve got to say, it looks a lot better trimmed. The soft watercolor paintings by Ferguson (of the Arthurian Tarot fame) transport the Rider-Waite-Smith imagery to medieval Wales, bringing to life Celtic legends, deities, and mythic figures. Although it is a distinctly different style from Kris Waldherr‘s art, something about Ferguson’s work here reminded me of the Goddess Tarot. 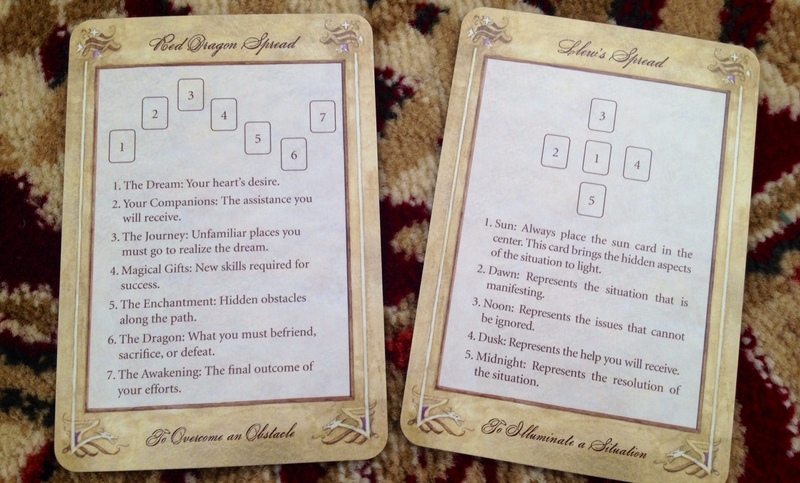 Thus, some of you may choose to not read with reversals when using the Llewellyn Tarot. In fact, a beginner just learning tarot who decides to go with the Llewellyn because that’s the deck she or he has connected with, I’d advise to not read with reversals, and honor the energy of the deck creator, Ferguson. The card back design is beautiful. It’s an earthy, woody brown watercolor wash and a golden medallion at the center, inlaid with Celtic-inspired detailing and a red dragon. The red dragon is significant, as Wales is referred to as the “Land of the Red Dragon” (something I learned in the accompanying guidebook), and the red dragon is the national emblem of Wales. Key VIII: Strength is the heroic Twrch Trwyth. Key IX: The Hermit is Myrddin, said to be the pagan inspiration behind Merlin. Key XI: Justice is the Lady of the Fountain. And so on. You’ll also note here in the Strength card, the figure is battling a wild boar, not a lion. The depiction was to provide a Welsh substitute for the original imagery. 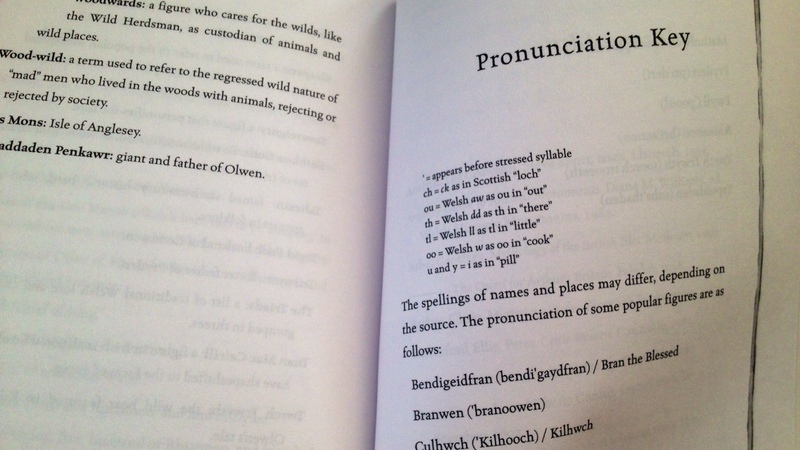 Also, thankfully, the accompanying guidebook with The Llewellyn Tarot has a pronunciation key. Based on how I read the pronunciation key, “Twrch Trwyth,” for instance, would be pronounced twerk trith. The imagery from the Majors are drawn largely from the Visconti-Sforza trump cards, though you’ll note that here in the Llewellyn Tarot, Key 8 is Strength like the RWS and Key 11 is Justice. Key 20 Judgement is associated with the legend of the sleepers. According to legend, King Arthur and his knights were brought to a cave and to this day remain asleep on their shields until the day when their country is need of them again. Thus, the card’s meaning is to hear the call of a new life, and resurrection. Now here every RWS reader is going to nod at the familiarity of the imagery in the Llewellyn minors. Notes Ferguson, “The minor arcana of this deck follow the well-known scenes of the Rider-Waite cards and yet contain some of my imaginative details and are not a slave to the designs.” You’ll see her own imaginative details in many of the cards, and I’ll point out my favorites as we go along. I love the added detail of the full moon in both the Four of Cups and Eight of Cups, reinforcing the sense of power, empowerment, manifestation, fertility, and harvest. 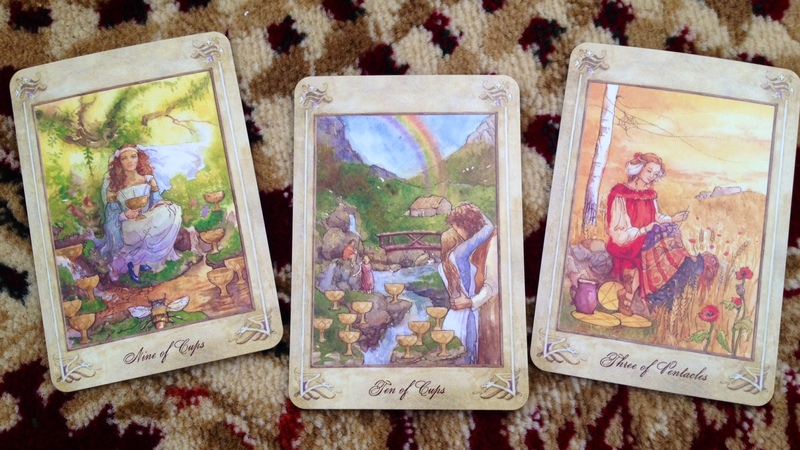 I also like the stream between the figure in the Four of Cups and the three chalices. 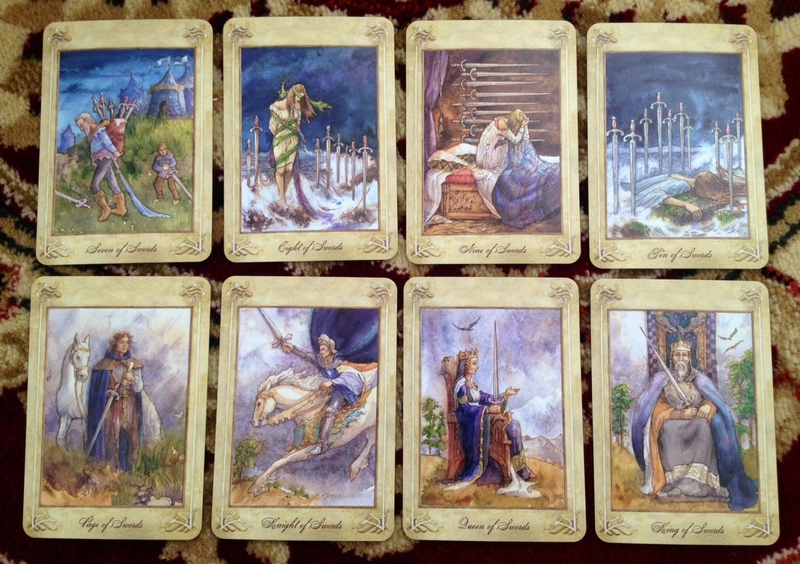 Sad that the figure with his back turned and walking stick disappeared from the Six of Cups. I really liked that symbolism in the RWS Six of Cups. The coloring and hues in the suit of Swords is lovely. I love the purple tones here and the depiction of my signifier, the Queen of Swords. Interesting change to the Ten of Swords, where the swords are around her (a bit like the Eight of Swords) rather than stabbed into the figure as it is in the classic RWS Ten of Swords. 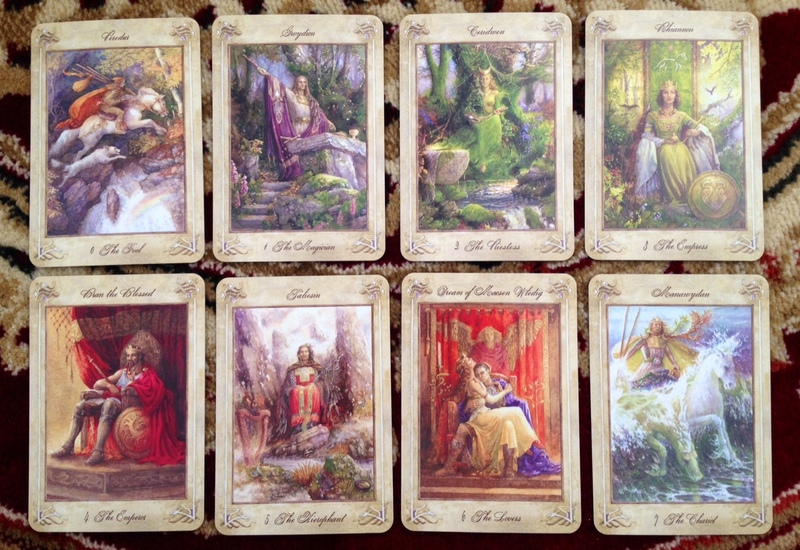 Overall, there are also more feminine or female figures in the Llewellyn Tarot than in the traditional RWS, which I much appreciate. I like that the juggling figure in the Two of Pentacles is a whole lot closer to the edge of the water in this deck than in the traditional imagery. The fruition in the Seven of Pentacles is now up, growing on a tree with apples, the fruit of knowledge, than in the bushes. Now there’s a figure companion alongside the original female figure in the Nine of Pentacles. Interesting addition. The subtle detailing that Ferguson added into the RWS deck are beautiful. For example, the bee in the foreground of the Nine of Cups, which brings an additional dimension to the card, symbolic of productivity and pollination. 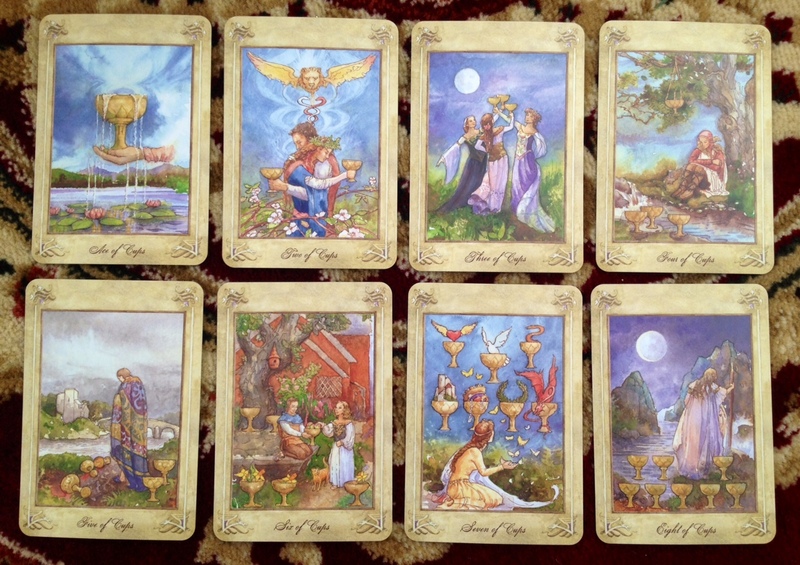 The Ten of Cups shows the home and family at the end of the rainbow, rather than directly beneath it, which to me expresses the meaning of the Ten of Cups through a more pagan perspective than the “under the rainbow, promise from God” Abrahamic expression. Ferguson changed the Three of Pentacles a bit from traditional RWS imagery, but I like it. It adds to the pastoral essence of this deck. The set comes with two instructional cards with spreads that pay homage to Wales and the founder of Llewellyn Worldwide. The accompanying guidebook instructs yet a third spread, the classic Celtic Cross. 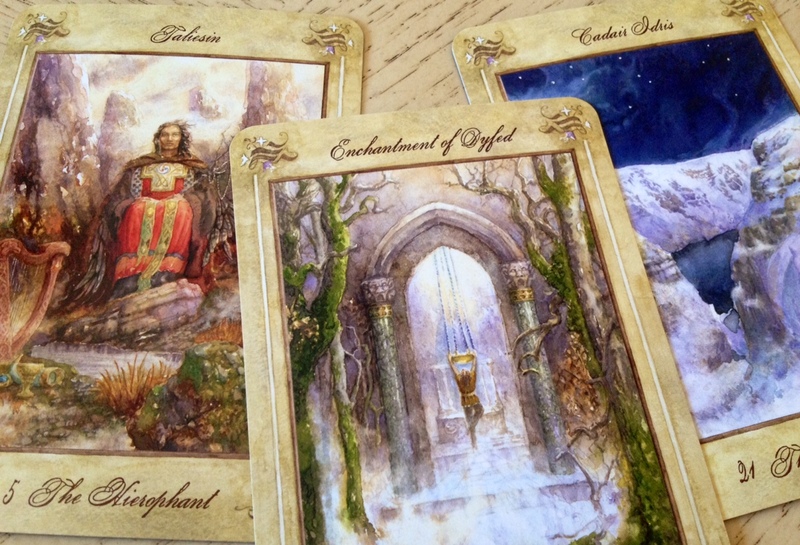 So how well does the Llewellyn Tarot read? Very well, actually. I’ll demonstrate with my typical go-to style of reading, which typically takes me 15-20 minutes when I’m being cognizant of time (because other people are in line waiting for readings or something) and up to 40 minutes when I’m taking my time with a client (or when the card counting part of this operation yields an exorbitant number of cards for the narrative, which happens from time to time). I start by selecting the significator (signifier), which I’ve identified as the Queen of Swords. After shuffling (in a way that observes card reversals), I cut the deck into four piles per the First Operation and go fishing for the signifier. Here she appears right away, in the first pile. Sometimes I’ll count how many cards in from the top-most card the signifier appears in that pile, and note that numerological significance. Here, I skipped that in the interest of time. That right-most pile corresponds with our physical plane, with Fire, and so here we’re focusing on issues relating to work/career, or maybe issues relating to body and health. We shall see. Either way, it’s in the seeker’s physical plane and is going to be evocative of Fire. Also, sometimes I’ll note the top-most card of every pile that’s been turned over (while searching for the signifier’s pile) and read that to the seeker as expressing what he or she most needs to know about that corresponding quadrant of life. Here we have The Hermit reversed. For me, when I see The Hermit, a voice in me says, “Study yourself to gain knowledge. Then be the light that others follow.” When The Hermit appears in reverse, though, it means the seeker is not yet ready to take the helm, and greater self study is needed before the seeker proceeds on the matter. Also, when the signifier itself appears in reverse, I see that as the seeker veering more toward an unproductive or negative path than toward one that is more in line with the seeker’s greater life purpose, so the double reversal here of both signifier and The Hermit is validating that a very strong, clear message is coming through. The signifier appearing in reverse is read by me as a warning signal, a red flag. When the signifier appears upright in this First Operation, it’s a positive validation. I then set down the signifier and begin card counting, a technique I talk about in Holistic Tarot. With the Queen of Swords, who faces right, I would normally begin counting right-ward, and set the cards down clockwise, but here remember that the QoS appeared in reverse, so now in effect she faces left. Thus, I count left-ward, counter-clockwise, in the direction the reversed QoS faces. Since I’ve explained card counting elsewhere, I won’t go into detail on the process here. The selected cards are pulled out of the circle and I simply draw them in the order that they appear starting with the signifier. Five cards were drawn from the card counting. I read these cards as a narrative, and not necessarily as a chronological narrative. 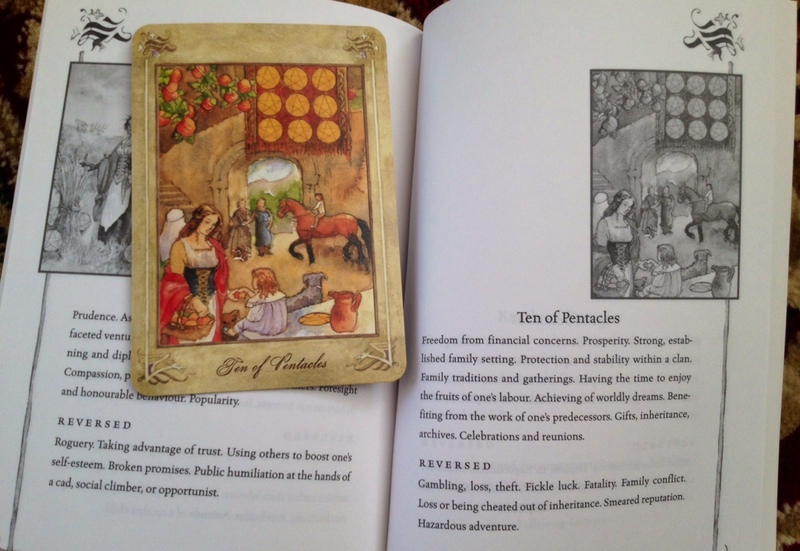 First, I note how the King of Pentacles, reversed and Key II: The High Priestess, reversed both hint at themes of duplicity, corruption, or deceit. More specifically, though, I see the King of Pentacles, reversed as indicative of short-sightedness and going for the immediate gratification, which echoes what the Two of Swords, reversed is saying, a message of hasty decision-making. Recall that the signifier appeared in the I pile, so all this relates to work in some way. [Yes, yes indeed. I’m nodding. I totally know what’s going on here.] Plus, I see maybe a family business, or a family dynasty of some sort, a family legacy that is coming into play– the Ten of Pentacles. The non-Earth cards in this string of cards are all in reverse, meaning their energies are weakened. Plus, even so, Earth cards dominate. So I’d tell me to pay attention to money, assets, finances, property. I do like the card in the center, though, that seems to the fulcrum here. 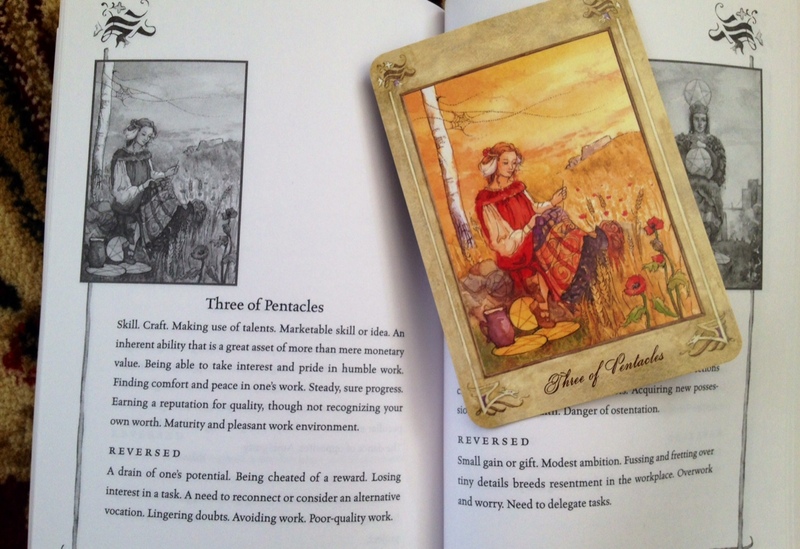 The Three of Pentacles is the card of the artist or craftsman. Long overdue recognition for my art or craft is coming. That is what balances out everything else that will be going on in my work/professional sector. At least that is what I get out of these cards. Now, just to get a sense of how useful the companion guidebook is for a prospective tarot beginner, let’s look up each of the cards one by one in the companion guidebook. I found much of what the guidebook has to say about card interpretation to align with my own approach. The card meaning sections are rather terse in the Minors, though it’s in the Majors that the guidebook shines. Will get to that later. 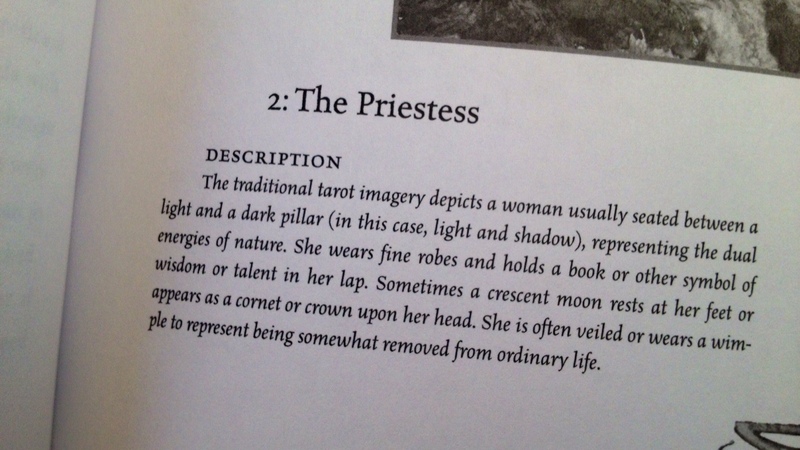 Here we get to one of the Majors, Key II: The High Priestess, or in the Llewellyn Tarot, The Priestess. 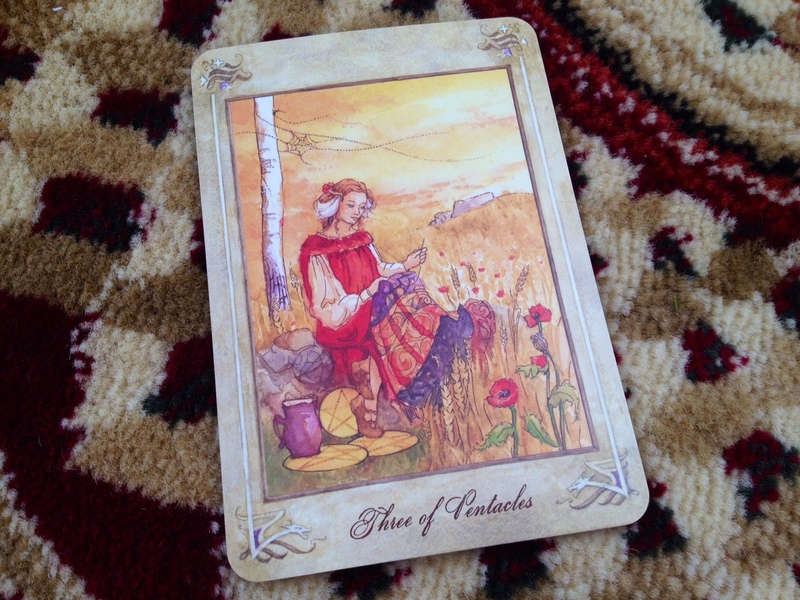 Preceding each card entry is a quick yet comprehensive paragraph in italics describing the imagery on the tarot card. The Priestess her corresponds with Ceridwen, an enchantress in medieval Welsh legend. 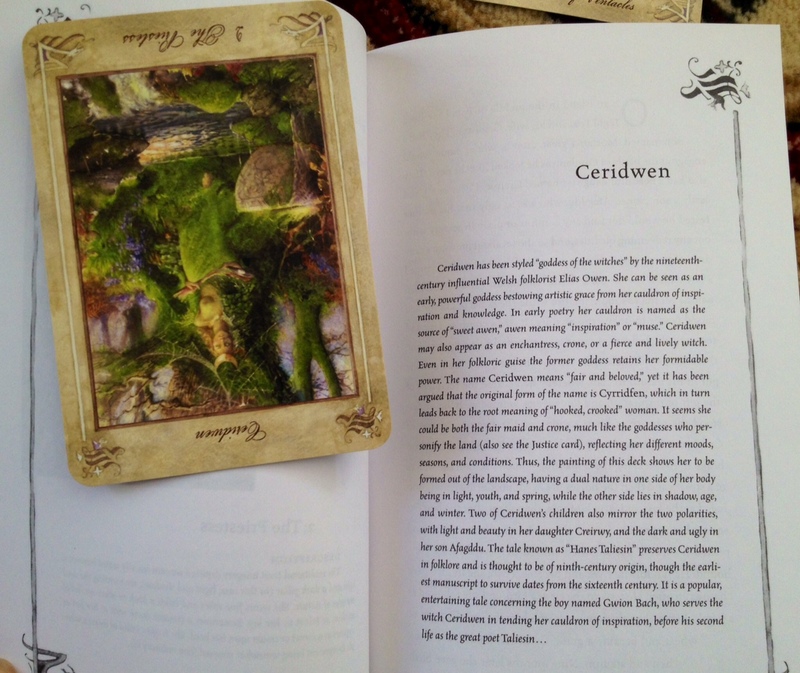 Here the guidebook goes into a lengthy discussion about who Ceridwen is and how she relates to the Priestess card. 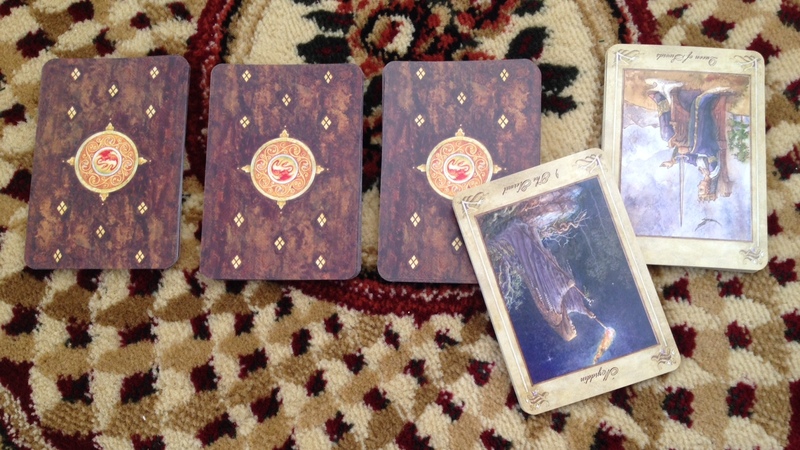 Now, continuing with my reading approach here, I then pair off the cards. Again, card pairing is explained in my book. Pairing off the cards explains cause and effect and further develops the “how” and “why” of the “what” that was given in the narrative. That’s why card pairing is important to me. We start diving deeper into what’s going on, and examining the elements here help. 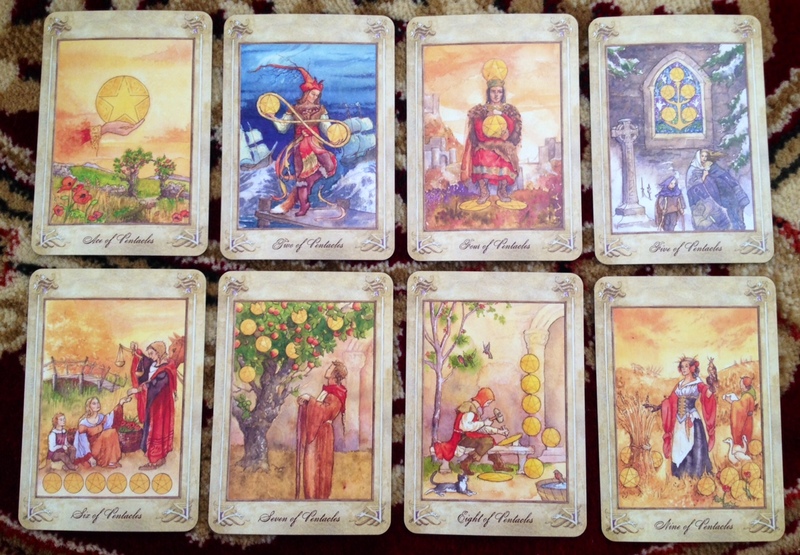 Here the King of Pentacles and 10 of Pentacles are paired off, and in addition, offering another message to me. Short-sightedness or the need for immediate gratification is posing a threat to that family dynasty or legacy. 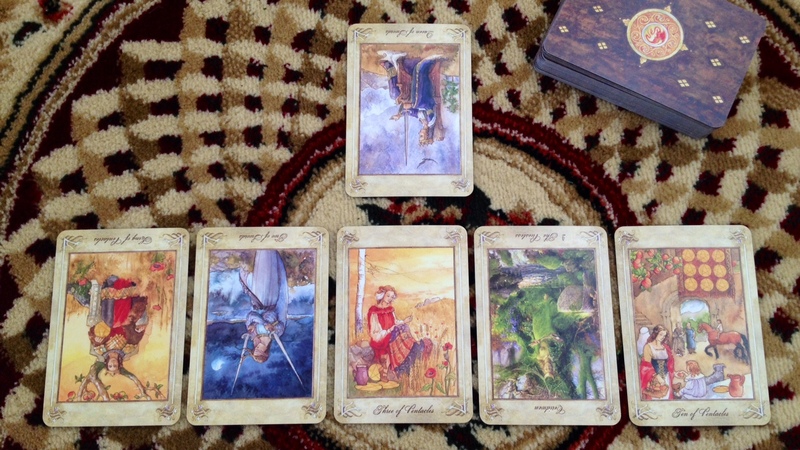 Note the pairing off of the Earth cards, and the other remaining Earth card, the Three of Pentacles, is a loner. (We’ll get to that shortly.) 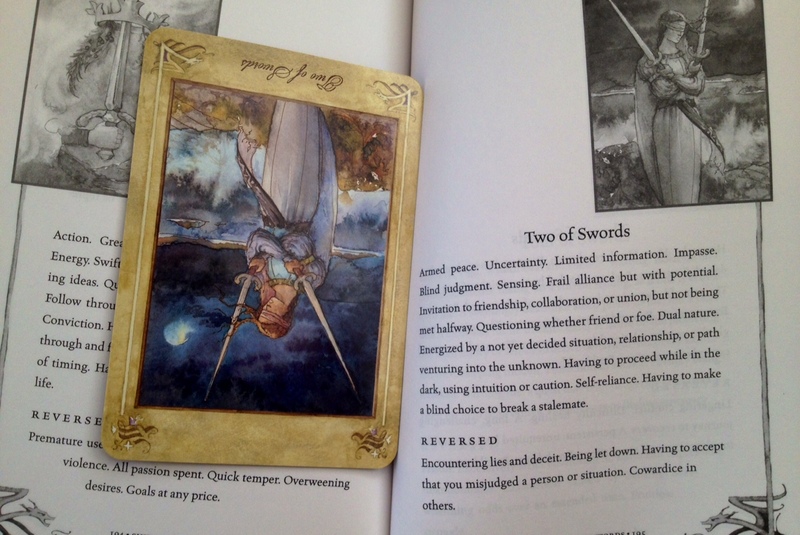 The other pair is both 2s, Two of Swords and Key II, and both are reversed, showing ill-dignified energy. The hasty, irrational, or bias-based decision made relates to the Priestess in some way, and what she represents here. Maybe there’s lying, covering up, or deceit to mask the poor decision that was made. Someone is not utilizing her full intuitive and clairvoyant abilities here. When there is an odd card out, as there is here in the 5-card narrative, I pay attention to that solo card. To me, it signifies the most important card in the narrative, the top note of the message here. That top note is positive. Creativity should be the focus. Craft should be the focus. Let everything else be moved to the periphery in the professional path. 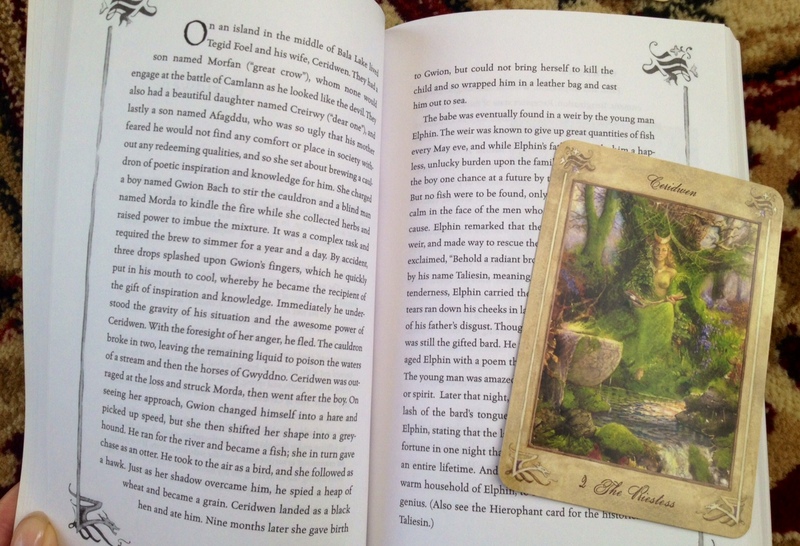 For me, I found the Llewellyn Tarot delightfully easy to read with and when I get to a Major, I love looking it up in the guidebook to learn more about Welsh mythology. I also love that the companion book comes with a glossary. It’s been so helpful. The one thing I disliked about the deck–which has absolutely nothing to do with the deck at all–is the packaging. Llewellyn has done this for other decks, too, like the Mystical Cats Tarot, and I griped about this issue then as well. I don’t like the cardboard insert thingie that separates the deck and book. The deck never fits in that space, and so when I open up the box, the cards are all over the place. So I ended up sewing my own drawstring tarot bag to go with the Llewellyn Tarot. The red cord even sort of matches the red dragon on the card backs. 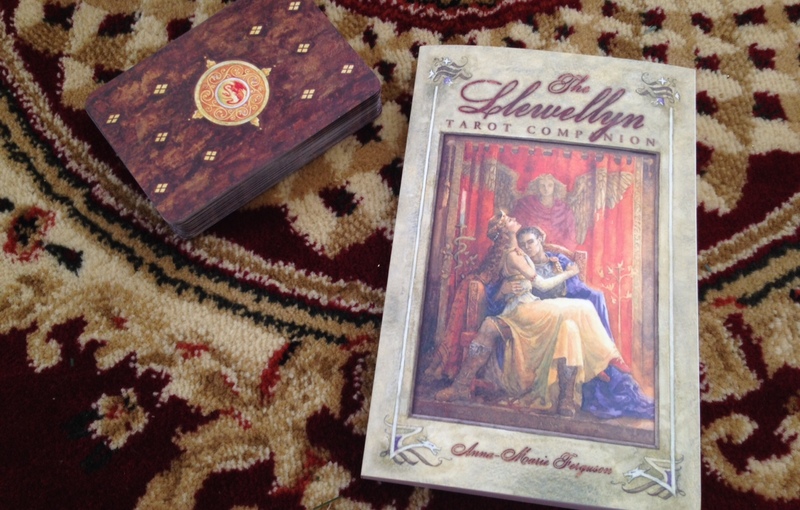 The deck copy I received of the Llewellyn Tarot is from its eighth printing, and I hope this deck will continue to stay in print. It’s a classic. 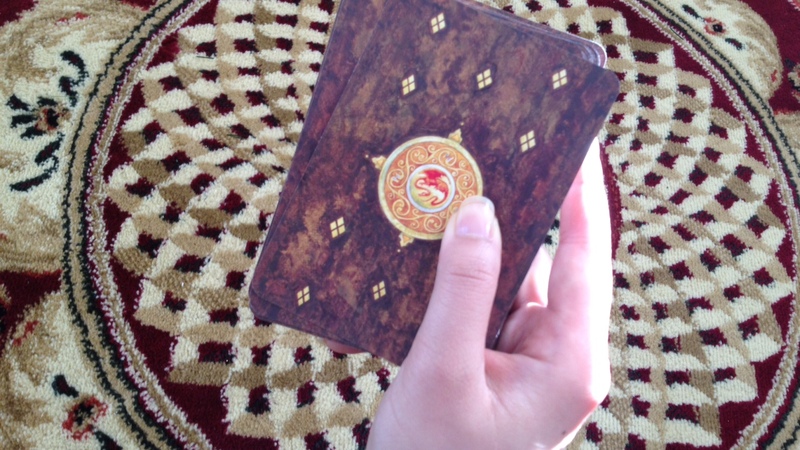 Young tarot beginners will love learning the RWS system on this deck. 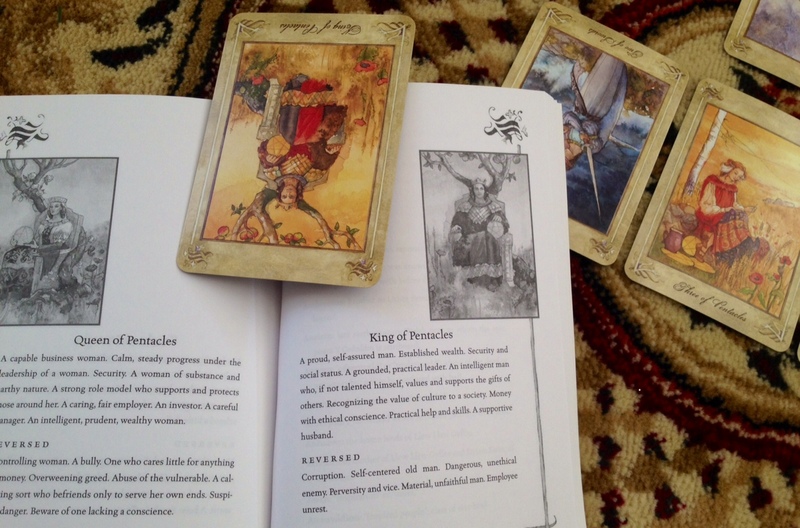 As a seasoned tarot reader, I found the Llewellyn Tarot to be full of knowledge and the companion book an enlightening read. It’s a fantastic guidebook for introducing the tarot deck to beginners and yet is so rich with culture-specific content that everyone will learn something here. Ferguson truly is a gifted, talented scholar and the breadth and depth of her knowledge shows in this deck. What a well done tarot deck. It’s ideal for beginners who find the original RWS or any of the esoteric decks a bit too jarring, and would make a great first tarot deck. It’s also a great collector’s item, given the themes here and the rich cultural imagery infused into the deck. I kind of wish this had been my first deck to learn on, and so now I’m thinking if in the future I find myself working with tarot students in their adolescence or young adult years who want to pick up tarot studies, this is the deck I’d choose for them. 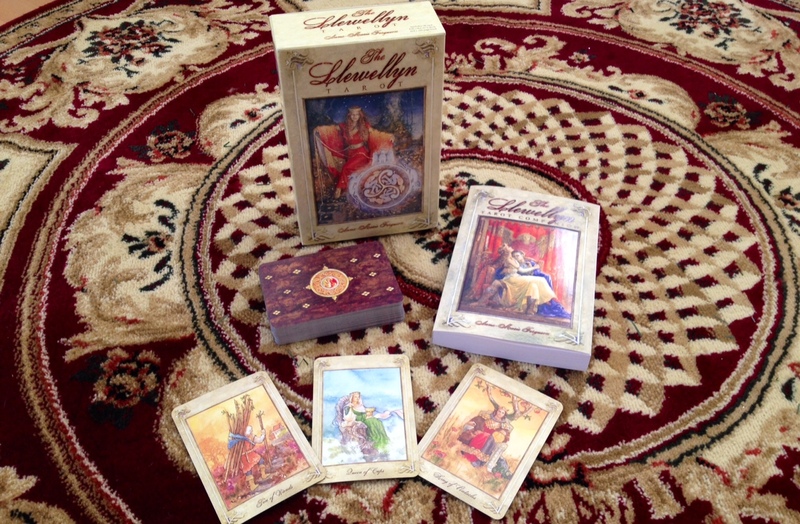 FTC Disclosure: In accordance with Title 16 of the U.S. Code of Federal Regulations Part 255, “Guides Concerning Use of Endorsements and Testimonials in Advertising,” I received The Llewellyn Tarot from Llewellyn for prospective review. Everything I’ve said here is sincere and accurately reflects my opinion of the deck. I’ve been feeling a restless pull toward a new deck lately…your reviews are so thorough and helpful! Thanks! Thanks! I enjoy doing them! Your deck reviews are always so thorough and detailed. I’m really liking this deck and hadn’t heard of it before. Is there any relation to the Llewellyn Classic Tarot? It’s my understanding that the Llewellyn Classic Tarot is a more recent deck, and the artwork there is by a different artist, in a totally different style, and doesn’t necessarily include the Welsh medieval iconography and characters that this deck, the Llewellyn Tarot does. 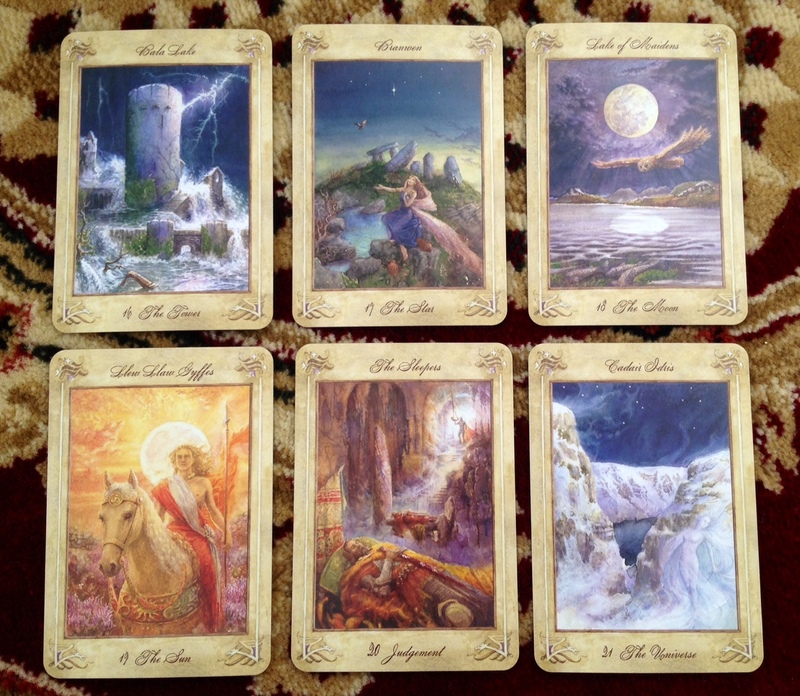 I’ve been eyeing the Llewellyn Classic Tarot, too, actually! If I get it, I might just do a comparison for you! I have got Llewellyn Classic, the images are bright colored and sharp, with good symbolism. However, I really struggle to read with it. 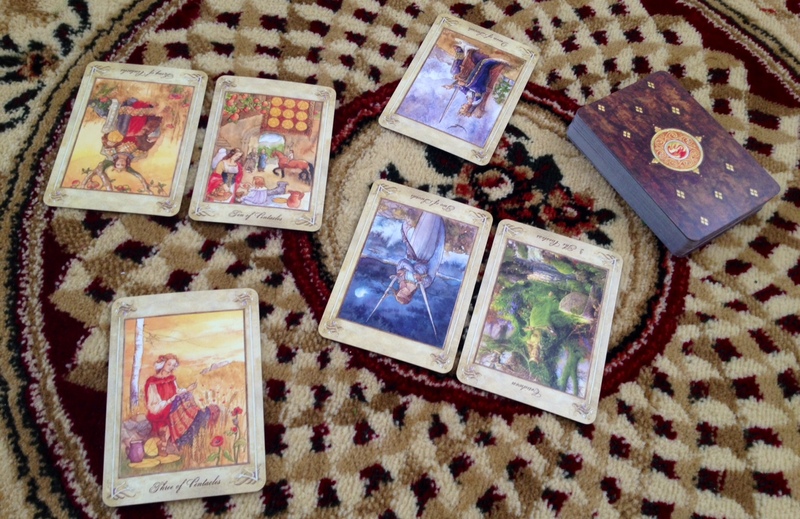 It doesn’t come alive to me like the Golden Tarot by Kat Black, but that would be a personal thing…. 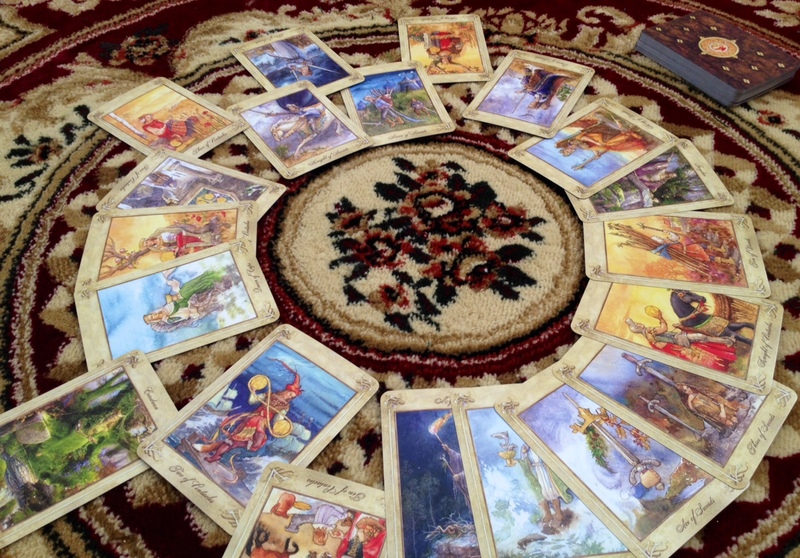 With the Golden Tarot, there’s a vibrant energy despite its collage art…. Thank you for the thoughtful reviews of the” Llewellyn Tarot”- it is gratifying to learn of those taking time to study the deck and write on its behalf:) It is the best that we artists/authors could hope for – and provides needed encouragement when we are on long large projects. My sincere thank you. Re the” Llewellyn Classic Tarot” – no, it is not any relation to the original Welsh “Llewellyn Tarot”. I am pleased you asked, since it is something that I have not spoken of before but has left – how shall I say..? distaste in my mouth. As author/artist, contractually we are not permitted to create as similar product (let alone title) for a competing publishing house. (Regardless of contracts, when I was courted for the Lord of the Rings Tarot in the U.K., I thanked them but explained, given Llewellyn was my first publisher and good to me with “Legend the Arthurian Tarot”, I could not create a tarot for any other house as “the sun would turn to black cloth” were my words, explaining a loyalty to the people at Llewellyn. Great complete review, thank you. As always, it was my pleasure! 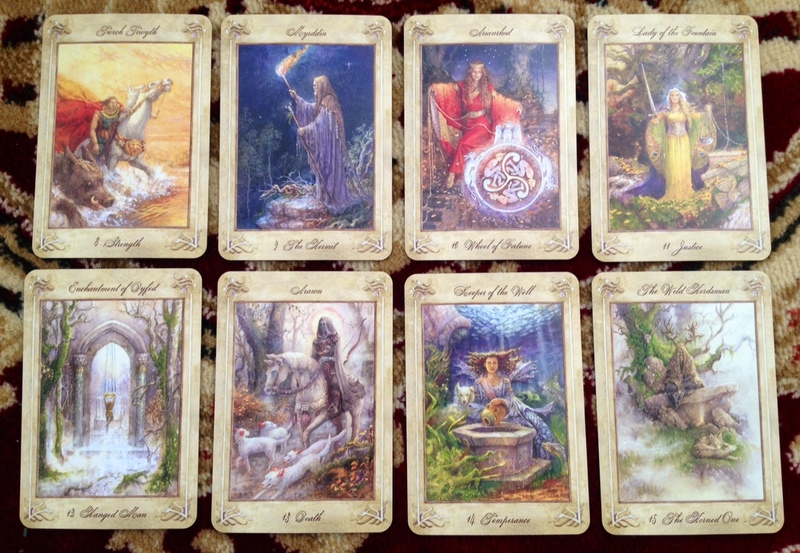 I have this deck and find much of it beautiful–it feels churlish to point out the bits of art that I don’t care for in this comment so I’ll skip that!–but the majors and their complete-affiliation feeling to the myths put me off somewhat. I am happy to spend time with little white books and with the bigger books that accompany many decks, and yet sometimes when I find that I do not retain the extra material, nor find the deck to be self-clear to me, I do not consider using it to read for others, since I feel obliged to refer to the book to clarify the deckmaker’s intentions. I am also less likely to use it for myself except when i have time to root around in the book a lot more deeply than I might wish to some days. In this deck, while the majors are lovely, I feel compelled to check the write-up of EVERY SINGLE ONE to see, “But why did the person choose this figure to illustrate the card? Was he a good magician who balanced the elements within himself and then used them for the greater good, or is he some sort of cautionary tale…?” I then do not retain the entire stories, however interesting they may be, and then feel sort of dopey that next time they come up, as every single time I wonder, “Wait, what did that say about why they chose that guy/woman/structure/reference again…?” When I was younger I knew all these stories, but now they do not stick with me. The mileage of others may well vary! I do enjoy the art of the minor pips and majors though, and hope the decks works for others more easily than it seems to for me! Donnalee, you are a far more analytical, intelligent, and inquisitive person than I am! Like you, I was definitely pulled to go to the guidebook every time I got a Major, wanting to know the story and characters there and reconciling it with what I know about that particular Major’s meaning and traditional symbolism. I’m not familiar with Welsh mythology, so this was REALLY interesting to me and I LOVED it. But as you eluded to a bit, by not knowing Welsh mythology, I did feel a bit crippled when reading with this deck. Oh, I wouldn’t say I am ‘a far more analytical, intelligent, and inquisitive person than’ you are, but as a stage manager I tend to look at things with an eye to what works for whatever the intended purpose is, and in this case it’s for me to read easily. You wrote such a comprehensive review that it will be helpful to many in various ways, including in prompting me to trim my deck and thus make it work for me! Trimmed!!! That could make the whole difference for me, to make it a straight intuitive deck (er, thus defeating all their effort in combining the cultural materials and all–oh well). I’ll let you know. Yeah I am super loving the trimmed versions of this deck that I’ve been seeing people post online. I trimmed them, and they are superb, in my mind: they gained character and mystery to me. 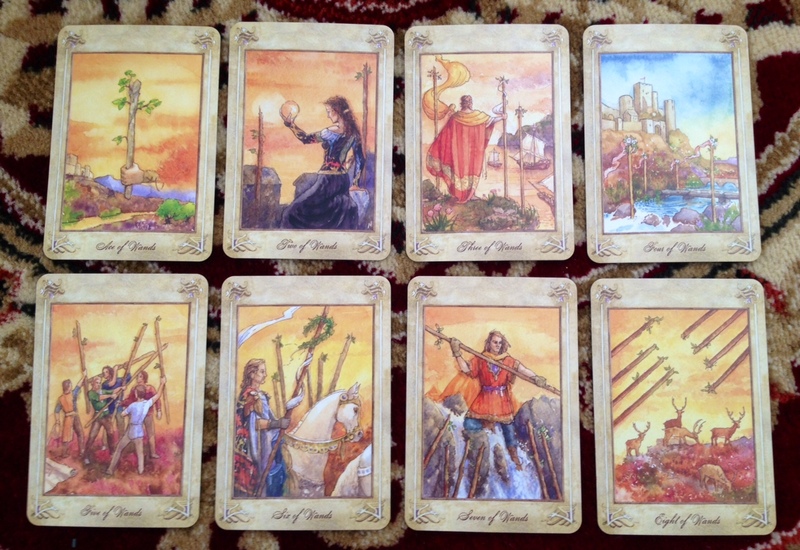 I almost am tempted to buy another Paulina Tarot which I love, and trim it, but I think I would swoon from the intensity of it–as it is, the borders keep it in emotional proportion somehow…funny! I’m an RWS reader but don’t always like using the Rider Waite. This one is so pretty and I love the subdued pastel art here. It’s a much better fit for me and my reading style than the Rider Waite. I also like that it seems to include a ton of information about Celtic mythology, which I’ve been meaning to read up on! Thanks!! 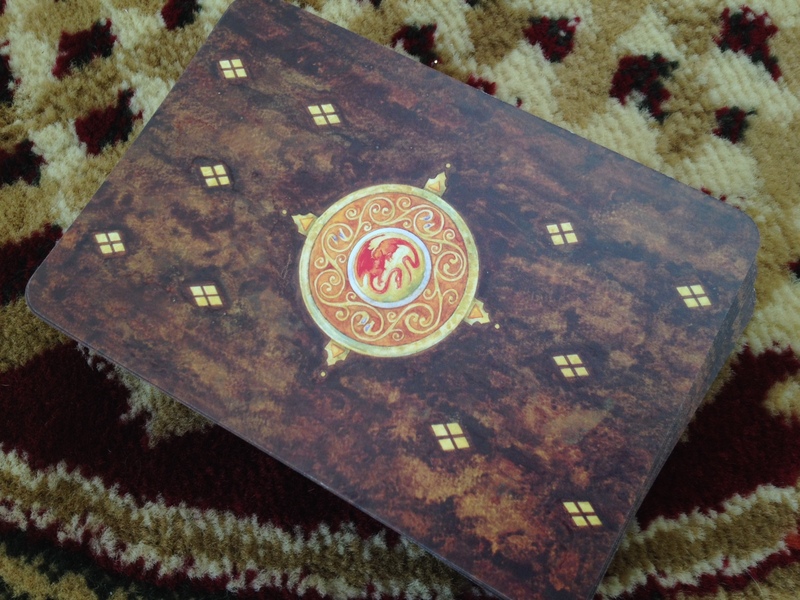 Thank you for your wonderful review of this beautiful deck, I’ve bought it and am loving it but also looking for more decks I can start using progressing into a post-beginner stage in my tarot journey. What are the other tarot decks (RWS-inspired or not) that you can recommend for beginners with some tarot understanding? I’m looking for a solid, visually appealing, if not stunning, deck with more modern imagery to connect with and learn from.